Four signings in four seasons. Between 2000 and 2003, four players traveled from the capital of Asturias to the capital of Spain. They affected the club in many different ways - some stayed for just one season, others for more - but each became an integral part of the team. Here are those four signings. In part 1 and 2, we look at two Oviedo mainstays who left for Madrid in 2000 and 2002. In part 3, we will examine a double signing, which happened at the heart of Real Oviedo's economic crisis in 2003. The Gijón native who have risen through the ranks of Sporting, played for the club, been bought by Barcelona and returned to Sporting once again, took a step that very few have the courage to do. He crossed the divide. He signed for Real Oviedo, and endured the wrath of the Sporting fan-base. It wasn't that this was a signing. This was the signing. The signing that broke a non-aggression pact between both Asturian teams. Midfielder Iván Iglesias started playing professionally with local Sporting de Gijón. 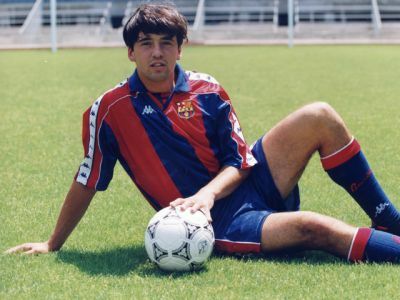 After only two seasons - and only appearing regularly in his second - he was signed by La Liga powerhouse Barcelona in the 1993 off-season for a 100 million pesetas, after agreeing to a five-year contract. Never an undisputed starter at the Camp Nou, Iglesias did amass nearly 70 official appearances in his two-year spell. During that two-year spell, he would go on to become a small part of Barcelona's history, with two goals that shook the 1993-94 La Liga campaign. On the 8th of January, 1994, he came on for the last 15 minutes, and closed the score-sheet for Johan Cruyff's side against Real Madrid, in a 5-0 home demolition - the first time in nearly 20 years that either side in the El Clásico had won by five goals or more. And Barcelona eventually clinched the league title, courtesy of an all-important yet severely underrated goal by Iván against Rayo Vallecano in the 32nd jornada, in the 82nd minute against Rayo Vallecano. However, a serious knee injury meant that he would return to Sporting for the latter half of the 1995-96 campaign. However, he would appear sparingly, and afterwards he switched to neighboring Real Oviedo where he would stay for four years, always in the top level. Afterwards, he would join Rayo Vallecano - however, injuries meant that his career at Rayo lasted just two seasons. Subsequently, during the 2002-03 campaign, he joined Cartagonova, in the Segunda B. He finished his career the following year, in Oviedo ACF in the Tercera, after a testimonial match with American side New York MetroStars (now the New York Red Bulls). Iglesias later opened a football school, with former Sporting teammate Juanele and Novo, a Spanish coach. The school is called JIN, after the initials of the three players - even though Juanele has since left, the initials still stand. While Iván Iglesias only spent four seasons at Real Oviedo, Russian defender Viktor Onopko played seven seasons at the club and enjoys the exalted position of having played the most times for the club for a non-Spaniard - in second place is Nikola Jerkan, and ironically Viktor was the player who was signed to replaced him. More on Viktor Onopko tomorrow, in part 2.